Having announced the new special edition D-Max Fury just last week, Isuzu UK has ensured it storms onto the market with the offer of highly competitive finance. The stunning Fury will be available on contract hire from just £215 + VAT per month* when it goes on sale in September. Conceived specifically for the modern, yet budget-conscious buyer, the Fury offers a unique Magma Red metallic paint finish, bold 17-inch, five-spoke grey alloy wheels, dark grey metallic finish to the front grille – complete with a fiery red Isuzu logo at its centre – and Cosmic Black door and tailgate handles. Gun metal grey heavy-duty side steps complete the exterior look. Buyers of the new D-Max Fury will benefit from more than just the purse-strings-friendly finance offer; Isuzu’s refined diesel engine returns a highly impressive fuel economy of 38.7 mpg (combined cycle), helping to keep running costs low. Inside, Fury features unique red stitching to key contact points such as the steering wheel and gear knob and dedicated Fury-emblazoned carpet mats. Customers also have the option to upgrade the interior seat upholstery to Limited Edition Black and Red Fury leather. 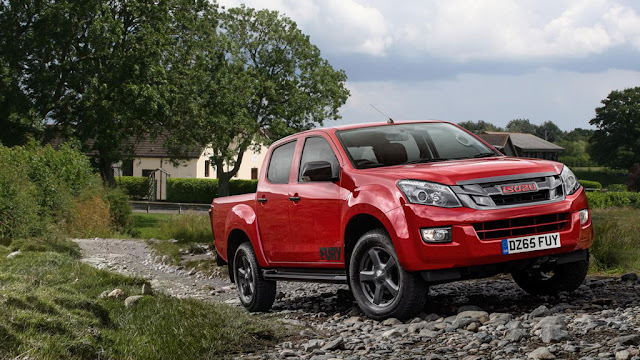 Like all new Isuzu models sold in the UK, the D-Max Fury will come with the company’s five-year, 125,000 mile warranty. That is a nice looking Isuzu and for £215 that is a steal, great looking car! Contract hire pricing from £215 per month will open this vehicle up to a new market. It is good to see as commercial type 4x4 vehicles lag behind in attractive finance offers.